Rent a medical rollator walker. Available from http://www.topro-usa.com – Topro Troja Rollator Walker. The best way to stay healthy is to get out and about in the fresh air. With the TOPRO Troja you can get back to the outdoors and enjoy nature again. Enjoy the sunshine. 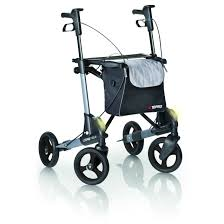 The TOPRO Troja evolved from the well loved and respected TOPRO Troja Rollator. It has been designed especially for those people who want to be able to walk in fields, woods and on gravel paths. The large, soft tyres have a comfortable hold on small stones and pass easily over tree roots. Even cobbled stones and high kerbs are easy for the TOPRO Troja rollator. The large basket at the front can carry up to 10kg (22lbs) in weight, ideal for the picnic or weekly shop at the local market. For the well earned rest use the built in mesh seat, take a break and enjoy the scenery. With a wide range of accessories available you can create the rollator to fit you and your needs. Torch for when it gets dark, a bottle holder for those hot sunny days, a transport bag for when you are off on your holidays, that’s just a small selection of what’s on offer. Incidentally the excellent brake system offers security when going down hill, something that a lot of other rollators on the market seem to miss. The easy to fold mechanism combined with the height adjustable memory function lets this outdoor rollator fold small for transport. For this reason the TOPRO Troja is an ideal travel partner for trips and holidays. Whether you are in the city, country, abroad or at home, the TOPRO Troja outdoor rollator can be relied on. World record attempt for Guinness World Records . 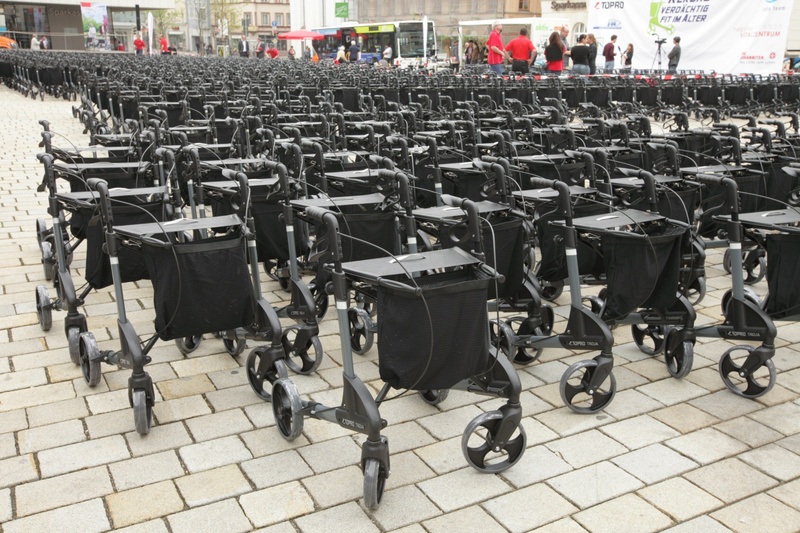 1000 individuals with rollators attempted to construct the world’s largest image of a rollator. Guided by the motto: Record breaking fitness, 1000 people were invited to assemble at city hall plaza to be part of the world’s largest rollator image made up of Europe favorite rollator the Topro 2G and its users. In the end, almost 400 people showed up and it is still being evaluated if this event qualified to be listed by Guinness World Records. The event was organized to help destigmatize the use of mobility aids and help create awareness around the opportunities of staying mobil and independent at high age. It was initiated by members of the applied sciences group at the FH Ingolstadt and supported by the premium rollator manufacturer Topro. The goal was to improve the acceptance and attractiveness of modern mobility aids amongst young and old. “Nowadays people get older and older and want to continue to participate in daily activities and their lifestyle and hobbies. Mobility is essential”, comments Thomas Appel, Managing Director of Topro Germany. Even today, seniors are skeptical about the use of rollators and walkers. And that despite the developments in technology and design over the last 20 years. The development of rollators has progressed just as other common mobility devices such as bicycles and scooters. Topro manufactures light weight and premium lifestyle mobility aids that help you go further and/or help your loved ones remain active and safe. Topro is also active in other community events such as http://www.walkerday.com, an event to promote safe walker handling.